A truck mounted reel systems manufacturer contacted Minarik Drives to help solve a problem they were having with premature speed control failures. 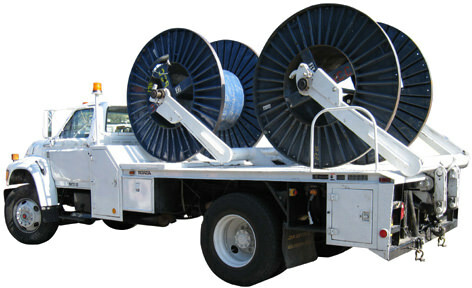 These reel systems are mounted on trucks and typically hold large spools of communication wire or hose. Two 24VDC motors, one mounted on each side of the reel, are used to drive the spool. A competitor’s 24VDC speed control, connected directly to the motors, was used to run each motor. Power came from two 12VDC batteries. The drive system is designed to aid in the dispensing process. An operator commands the motors to run in the desired direction via switches and speed pots on a hand held pendent. To unspool, motors are run in the payout direction as workers guide material to the desired placement location. The system worked well for the most part, but the competitor’s drives were experiencing a high failure rate. After analyzing the customer’s setup, Minarik Drives engineers discovered the problem. It turned out that during the unspooling process, workers at a site, in an effort to unspool material quickly, would pull material faster than it was being paid out. In essence, the reel spinning faster than it was being driven was turning the motors turn into voltage generators. The voltage generated was being fed back into the drives BUS capacitors overcharging them to the point of failure. When the customer was presented with this theory, they acknowledge that they too had suspected this. They had unsuccessfully made an effort to remedy the problem by adding output contactor on the drives. The contactors were controlled by a switch on the handle held pendent. The problem with this setup is that the person operating the pendent did not know when the motors were feeding voltage back into the drives and essentially never knowing when to open the safety contactor to prevent back driving. Our solution use a variation of our DC60-36/48-4Q, a microprocessor based smart drive. What made this model particularly well suited to solve this application is an output that can be used to control an external contactor. This output, on a standard drive, is meant to control a main input power contact, but in this application it was repurposed to control an output contactor. A custom program was written where the drive would command the output contactor to open when the motors generated unsafe levels of voltage. When the drive senses that the voltage was back to a safe level, the drive automatically closes the output contactor and the motors again receive voltage from the drive and continue to aid in the unspooling process. Our custom programmed drive eliminated the possibility of drive damage due to user error. In the long run, the customer and end users saved time and money by reducing downtime due to system malfunctions. This application was brought to Minarik Drives by Dan Travers through one of our distributors, Power Torque.